I also thought I’d take the opportunity of working with the MySQL Workbench to design the tables involved. Unfortunately the product is effectively unusable on my system until at least rc7 (due when?) and b/c it only support windows, I’m not up for a download the source and compile. Oh well. I used our own (Quest Software's) Toad Data Modeller instead. 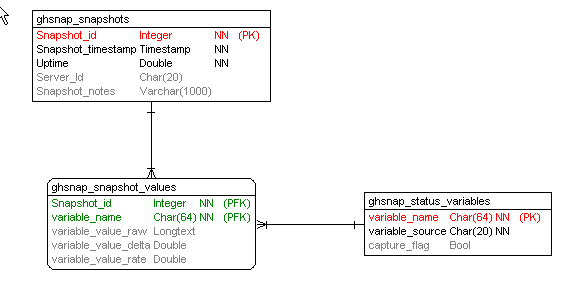 GHSNAP_SNAPSHOT_VALUES contains one row for each variable for each snapshot. We capture the raw value of the variable, its change since the last snapshot and the rate of change per second. ghsnap_populate_variables creates default entries in the GHSNAP_STATUS_VARIABLES table and is run only during installation. By default I set it up to capture all the INNODB%, COM% and QCACHE% variables but you might want to change the CAPTURE_FLAG for those you do/don't want. ghsnap_take_snapshot takes a snapshot of GLOBAL_STATUS and stores it in the snapshot tables. It also works out if the server has been restarted and if not, calculates rates and deltas. ghsnap_delete_snapshots deletes all snapshots more than a certain number of days old. ghsnap_take_snap_event runs (by default) every five minutes and simply executes ghsnap_take_snapshot. ghsnap_delete_snap_event runs every 5 hours (by default) and deletes snapshots more than 1 day old (you can edit the installation script to change this default). Nothing earth-shattering but still useful and - with the event scheduler, stored procedures and the new INFORMATION_SCHEMA tables we don't need any external infrastructure to capture this information. 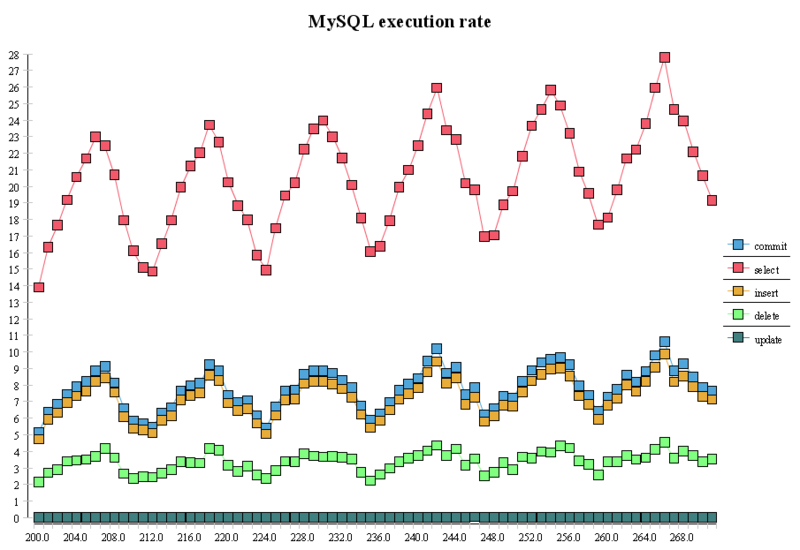 We'll probably implement something like this in the next version of our freeware Spotlight on MySQL as well as better diagnostics on replication and exploiting the fact that in 5.1 you can get SELECT access to logs. Feel free to check it out. P.S. don't forget that to set EVENT_SCHEDULER=1 to enable events on your 5.1 server. And watch out on Windows where the event scheduler in 5.1.14 still seems a bit unstable. Nice trick, but why aren't those values available from information_schema tables? The instantaneous values are indeed obtained from INFORMATION_SCHEMA.GLOBAL_STATUS. The "trick" is to create an historical record of selected values so we can do some trending or historical diagnostics. In the past we could have done this by running some external program (in perl say) that issued SHOW GLOBAL STATUS commands and saved the values and deltas back into tables in the DB. But with the INFORMATION_SCHEMA table we can get the values within a stored procedure, and with the new events mechanism, we can run that stored procedure _inside_ the database.